Clark, Mindy Starns. And Gould, Leslie. My Sister’s Prayer: Cousins of the Dove- Book 2. Eugene, OR: Harvest House Publishers. 2016. 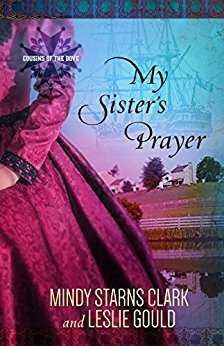 As the second book in the Cousins of the Dove series, My Sister’s Prayer continues the Talbot family story, following the story of two sets of sisters-one contemporary and the other historical-separated by 300 years. Told in the first person point-of-view, alternating between present and past, the sisters’ lives run individually yet intertwine through a family heirloom. Romance, sisters, secrets, and hardships divide yet combine the centuries as sisters realize the importance of devotion. Liking authors Mindy Starns Clark and Leslie Gould, I was ready to read their combined novel. Though perhaps just a bit confusing in the beginning, it wasn’t long before I caught on and sped through the book. (Confession- I did not read book 1, My Brother’s Crown, which may have helped my initial confusion.) Skillfully making the first person POV work well within the story, the added design of parallel yet perpendicular stories only enhanced the creativity. With book 3 already on the horizon, I most likely will read the previous novel to be ready for the May 2017 release of My Daughter’s Legacy. This entry was posted in Christian Books and tagged Adventure, Christian, Christian Author, Christian Book Review, Christian Contemporary, Christian Fiction, Christian Historical, Cousins of the Dove Series, Inspirational, Leslie Gould, Mindy Starns Clark, Mystery by Savurbks. Bookmark the permalink.